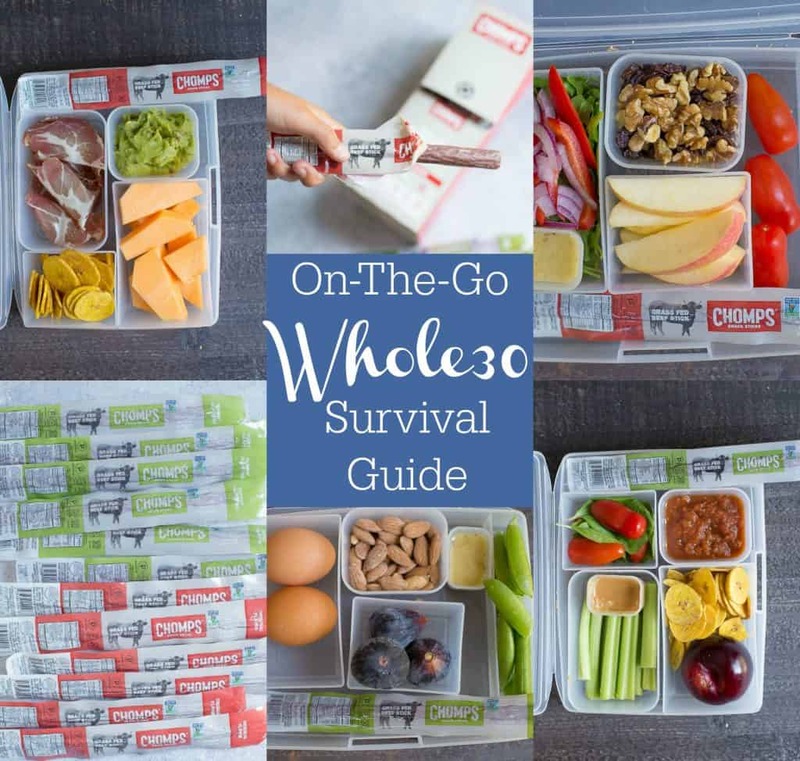 Just to let you all know, this On-The-Go Whole30 Survival Guide is sponsored by my friends at Chomps! So here you are cruising along around day 10 of your Whole30 and you are feeling great! 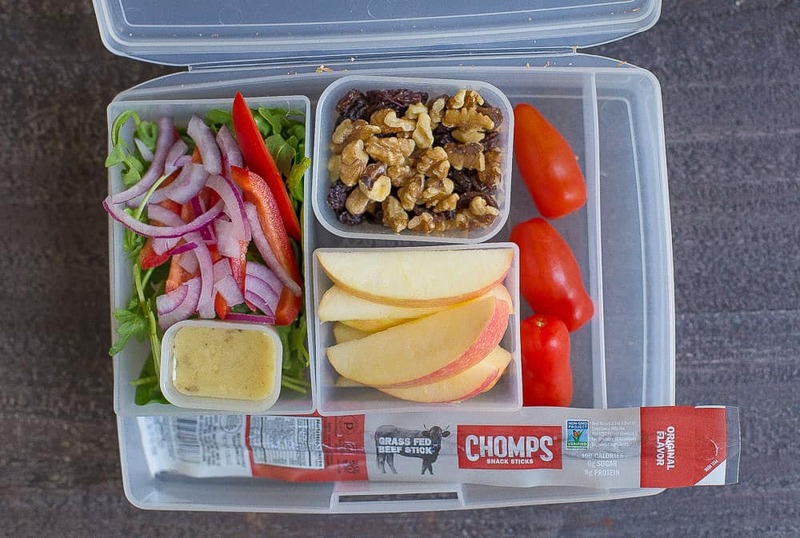 You’ve been packing lunches like a rockstar, and prepping all of your meals (virtual high five!!). 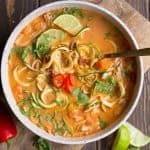 You’ve been making dinner every night, making sure you have leftovers for the next day, and even making extra meals every few days to last you throughout the week. Let’s just be real. It’s kind of exhausting, right? You are soooooo ready to hit the easy button. Or maybe a last minute work trip has been thrown on you, and you realize that in that third week of Whole30, you will actually be TRAVELING. And having to eat out. How are you possibly going to manage that?!?!?! Or maybe you are out all day away from home, and just completely forgot to prepare anything or pack for this Whole30 thing. Your options are to get very Hangry, or to grab some food full of junk ingredients that make you feel like…….well, junk. Guess what guys. There is hope for you. You can still live your life, not panic, and remain Whole30 compliant. So… true story: Mr. Wholesomelicious and I just started another round of Whole30. We’re on like day 3. He comes home and tells me that he needs to travel for a few days. And then asks, “so does that mean I won’t be able to do Whole30? What the heck am I going to eat when I’m not at home?” Translation: wife, you make every meal for me and I am so ridiculously spoiled. Will I be okay? Yes. He will be okay. In fact, even while on Whole30, you don’t have to enjoy a home-cooked meal 3 times per day. So let’s dive in and discuss ideas for you busy, on-the-go people. 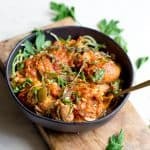 I’ve compiled plenty of options to keep you well fed and satisfied while on Whole30, even if you don’t have the opportunity to cook! First off, my absolute favorite high protein snack: Chomps. You can buy online with FREE SHIPPING and a 15% off discount using the code: WHOLESOME15, purchase on Amazon, or buy in stores at Target or Trader Joe’s. 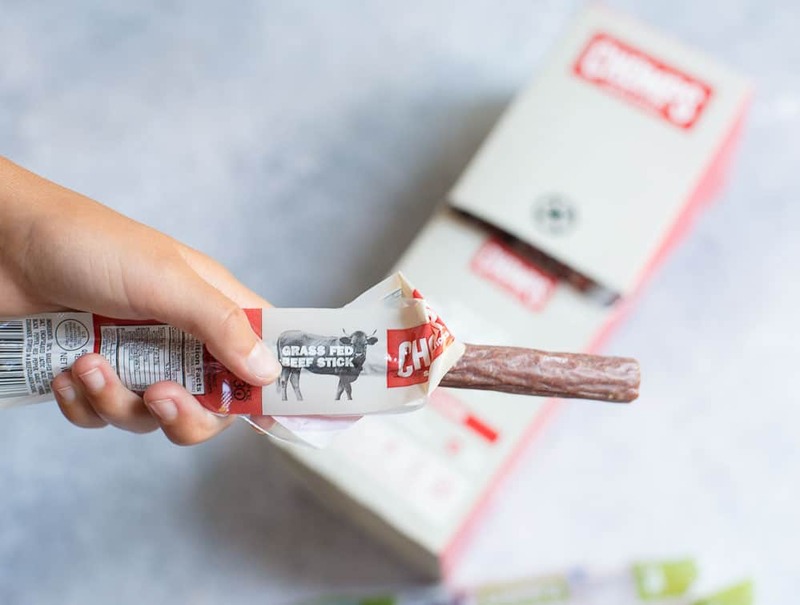 Chomps are snack sticks made with 100% grass-fed and grass finished beef packing in 9 grams of protein per stick. Only the highest quality, non artificial ingredients with no MSG, fillers, binders, or added preservatives. Certified Paleo, Whole30 approved, and non-GMO verified! They have 4 delicious flavors: Original, Beef Crankin’ Cranberry, Beef Hoppin’ Jalapeño, and Venison Cracked Pepper & Sea Salt. I have 2 boxes (48 sticks) to last us for the rest of our Whole30. We put some in my husband’s car so he can have them whenever he gets hungry on-the-go and he needs a quick fix! This will also come in handy when he travels. I also have several in my purse to cover me when I get hungry. I am personally obsessed with the Beef Hoppin’ Jalapeño! So yummy, with just the right amount of kick. 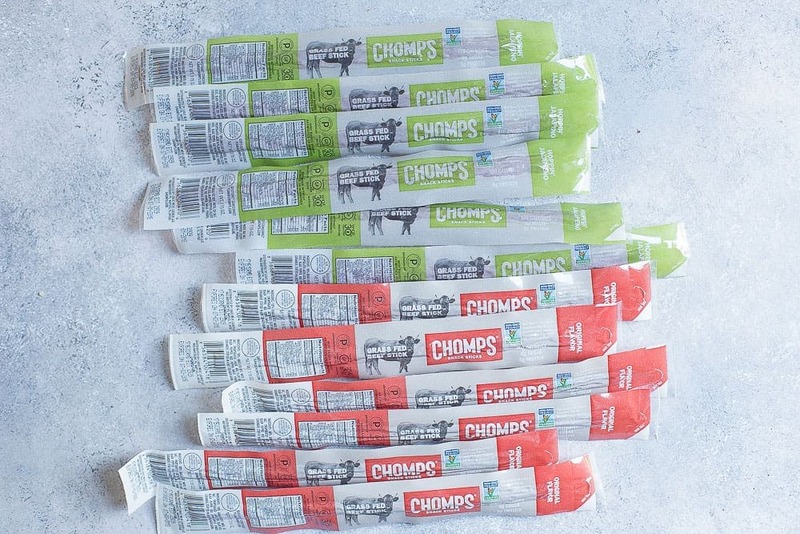 To give you some ideas, I have paired my Chomps sticks with several other snacks that are simple to pack and require little or no preparation! If you also find yourself needing to stop at a store, you can easily find these snacks. For those of you traveling, these combos require no cooking, can last a few days, and can even come with you to a hotel room. 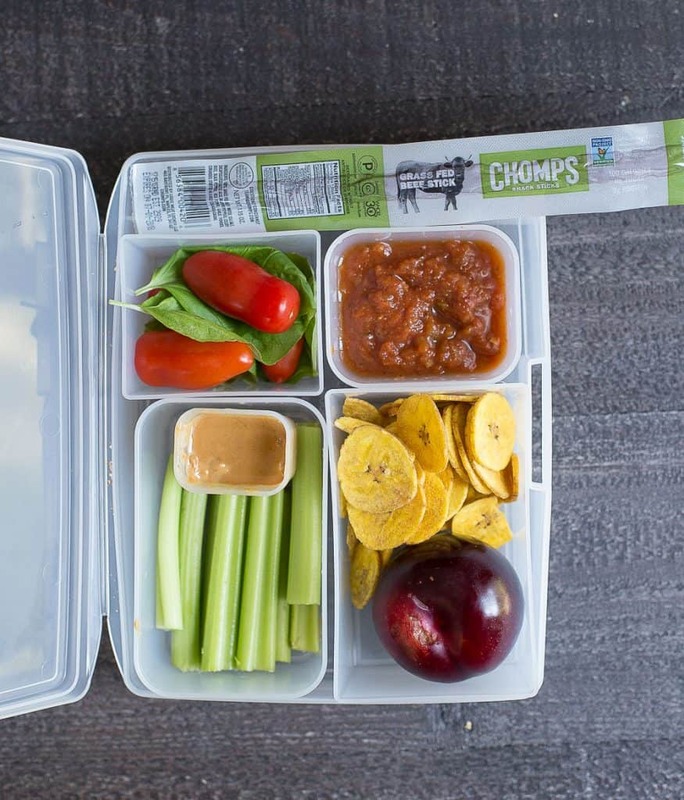 First off, celery sticks with almond butter, tomatoes with basil (sprinkle with salt and balsamic vinegar), plum, plantation chips with salsa, and a Chomps stick. 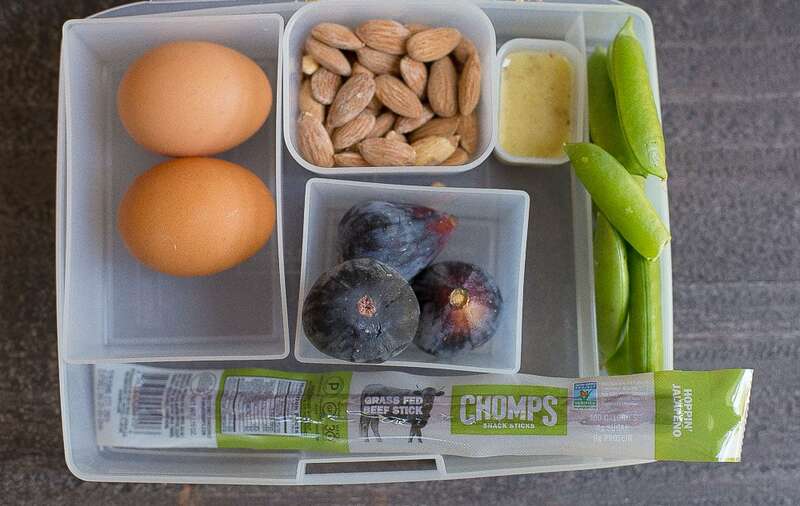 Hard boiled eggs, almonds, figs, snap peas with a simple vinaigrette that I always keep in my fridge (avocado oil, vinegar, dijon mustard, oregano, salt, and pepper), and a Chomps stick. 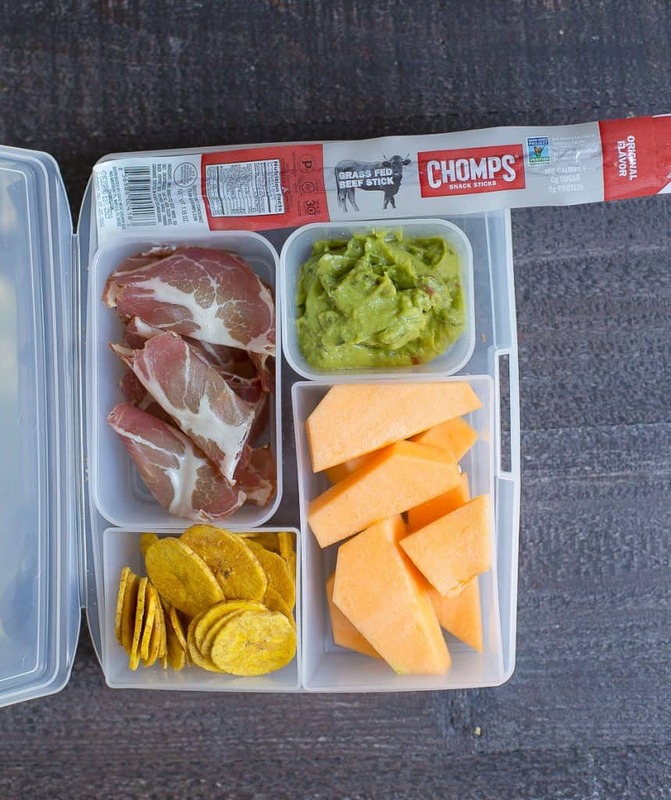 Prosciutto slices, melon, plantain chips with guacamole (most store bought fresh guacs will be compliant), and a Chomps Stick. Quick salad with vinaigrette, homemade trail mix with walnuts and raisins, apple slices, and a Chomps Stick. Chipotle: You can order the Carnitas (all other meats are cooked in Rice Bran oil), and top with lettuce, salsa (any of them except the corn), and a bunch of guacamole. Five Guys: The Five Guys burgers have no added ingredients or fillers and are compliant; just asked for a burger with no bun. Load up with vegetables such as onion, lettuce, tomato, pickles, and peppers. Five Guys needs to add avocado as an option! Or bring one in (I might have done that before). Panera: You have to be a bit more creative with Panera. The Green Goddess Cobb Salad is compliant without bacon or chicken. The garden salad is also an option with oil and vinegar. Whole Foods: The Whole Foods Salad Bar and Hot Bar has many options for Whole30 compliant recipes. 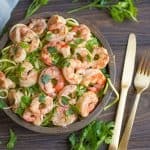 This is one of my favorite places to eat while on Whole30! Indian Food: (My personal FAVORITE!) Tandoori meats are the way to go. Plenty of spices and flavor, and often come with veggies. Curries, Masala, and Korma may also be okay, just be sure to ask if they are dairy free (some Indian food may have cream). 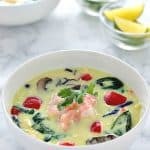 Thai Food: Thai food curries are usually compliant (ask if added sugar or cream is used), and packed with veggies and protein. 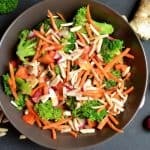 Eat without rice! Steakhouses: Many steak houses will give you the option to have a side or two. Ask for steamed veggies and baked potatoes or sweet potatoes. No need to be left hungry!! And most important, no need to feel that it’s too difficult to navigate for your busy lifestyle. 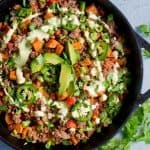 Enjoy these easy tips for a successful round of Whole30. You got this!! THIS POST IS SPONSORED BY MY FRIENDS AT CHOMPS. THANK YOU FOR ALLOWING ME TO CONTINUE BRINGING YOU GREAT CONTENT BY SUPPORTING PARTNERSHIPS WITH BRANDS THAT I LOVE! AS ALWAYS, OPINIONS REMAIN 100% MY OWN! 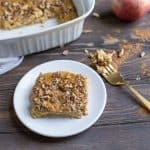 Love these ideas and your meal plans! Just FYI though, they changed the Whole30 rules a few months ago that you’re no longer allowed any store bought chips, even with compliant ingredients. So the plantain chips are probably out as I don’t know where you got them from. These are great though – we all need fresh ideas! HI Ann, thanks for stopping by! I know I was pretty bummed about the plantain chips that we were able to use in our previous rounds of Whole30! I’ve started making my own, which are tasty but a lot more time consuming.